Learn how to recognize and evaluate the diseases and conditions encountered in dental hygiene practice. 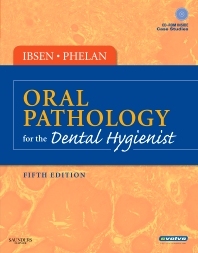 Oral Pathology for the Dental Hygienist delivers the ideal combination of clinical photographs, radiographs, and discussion to help you identify and document the appearance of normal and disease states. This user-friendly, atlas-style text features 500 illustrations (more than 350 in full color), including clinical photographs, radiographs, photomicrographs, and line drawings, along with case studies, review questions, and synopsis charts. The learning tools and updated content of this text make it a valuable resource for your coursework and exam preparation as well as a solid reference to consult throughout your professional career.